We saw a guy bury his boat on a mud flat near the old boat ramp. That area of the lake is stumpy as all get out. The fish are on the deep main lake banks or at the mouth of large coves. There’s a ton of fish schooled in the middle of the cove at the mouth, hugging the bottom in 40ft of water. They appear to be following large schools of shad. Can these fish be caught with the “evil alabama rig”?????? I love some Eucha, just don't get down there as much as I did 5 years ago. When the crappie were missing at Grand for a few years, I went to Eucha all spring. The last couple years I've only made about 1 trip a year down there. Just a beautiful lake. I havent tried the crappie, yet. I've only been over there a half dozen times since last year. Low water has helped me learn the lake. Trust me, you should. It's a fantastic Crappie lake. Unreal how many of them are in there. I thought about fishing the stump flat around the boatramp area. set a bobber at 2' and hit every stump in there. I might fish a slip bobber on a jigpole around that standing timber in deeper water. I was almost run over by a small buck in the gravel parking area on sunday. That dude was on the move. Eucha is one of my favorite lakes. you might already know this, but on Eucha, look for recently cut (~3 years) stumps on the bank. There will be a brushpile near by. The locals just go out in the middle of the night or on a cold day and chainsaw down an entire tree and then throw cinder blocks over it to sink it. It's no secret, but if you are fishing the upper lake, over behind the old water intake dock there is a ton of sunken brush. If there's not a boat already in there you can usually catch a fish or two. I do most of my fishing on the lake on the lower half from Rattlesnake to the spillway. I just like it down there. I drive past rattlesnake everytime I go there, but dont fish it. had no idea they cut down trees right off the bank and sunk them. I thought that was state owned property? I like the big cove near the dam, Galcatcher maybe. Theres some nice standing timber close to those little bluff banks. Although, I didnt get any bites back in there. All the fish are at the mouth of the creek or on the main river channel. 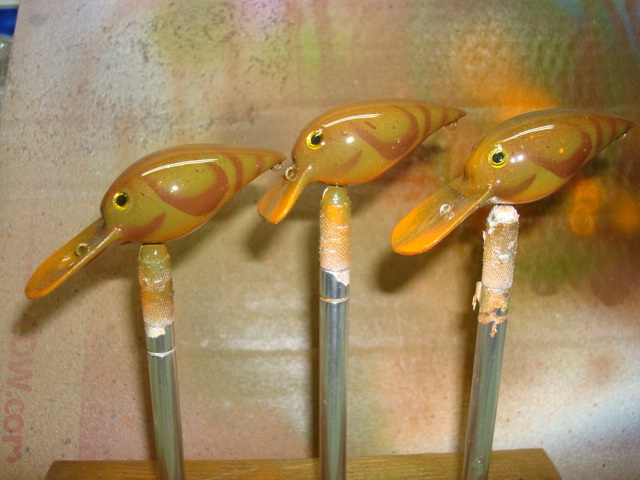 just like the crankbaits that I've painted. That creek arm that comes in on the South side is one of my favorites if that's the one you are talking about. it has some of the only standing timber on the lake. An old, old, timer told me they left 6 trees standing when they made that lake and two of them are in that cove side by side. Those locals down there are mostly Indians. They don't give a fry if it's owned by the State or not. They'll cut those trees down in a heartbeat. Nice cranks. Those should work. Eucha is also the only place I know of that you can sight fish for spawning crappie most years. It sure is a lot of fun to sit over the top of those big coontail beds and tease male crappie into biting your jig. Not to mention the limit is 37 fish on that lake. You can get a mess of them in a good day of fishing down there. Also some of the biggest crappie I've ever caught came off that lake. thats the same cove. they're near a small bluff end. Theres 3 standing trees in that cove. I know of a 4th in the midlake area, so I guess fishing it during low water has paid off. Ive seen the water willows on the shoreline, but I didnt even know it had coontail. I sure as heck didnt know the crappie limit was 37.